WoSign Free Secure Email Certificates-WoSign SSL Certificates! 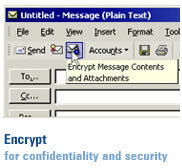 WoSign offers fully S/MIME compliant Secure Email Certificates FREE for personal use ! ** Microsoft and the Office logo are trademarks or registered trademarks of Microsoft Corporation in the United States and/or other countries.